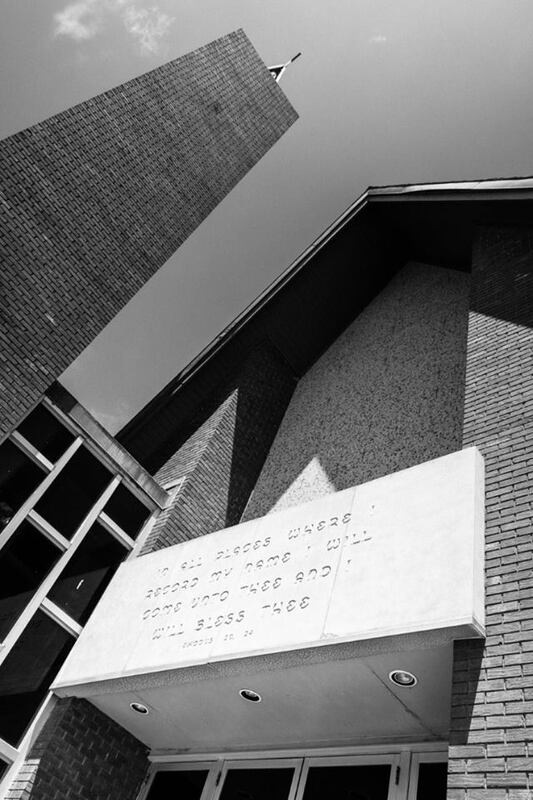 I don’t normally post many photos of newer churches, but this one is the work of Wendish architect (and photographer!) Eugene Wukasch, who operated an office at 2000 Guadalupe in Austin for a number of years. 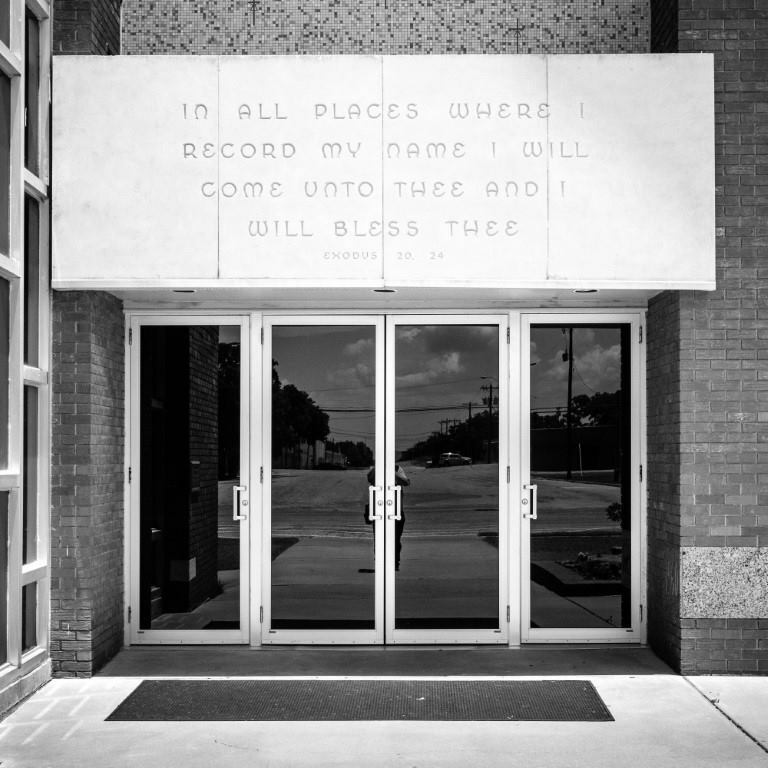 Wukasch drew up plans for a number of churches throughout Texas during his career. He was confirmed at my church (St. Paul’s Lutheran Church in Austin). I’ve recently become interested in his work. 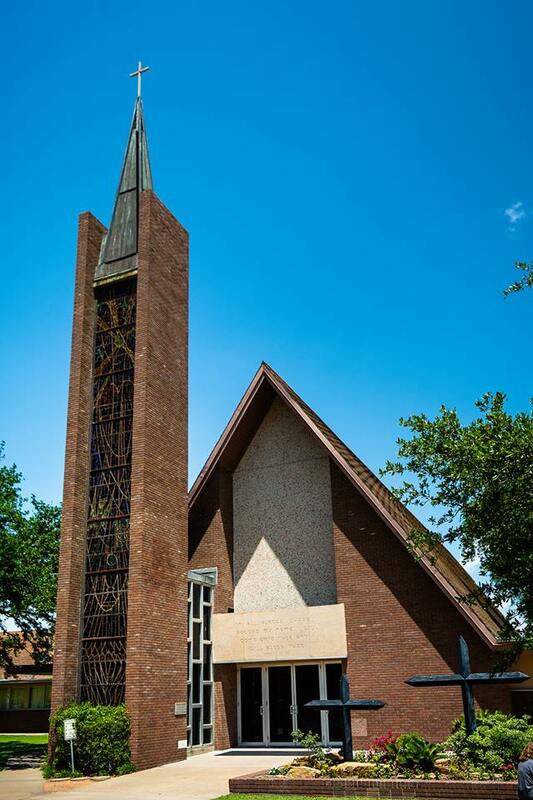 Immanuel Lutheran Church in Giddings was built in 1960-61 from his plans. 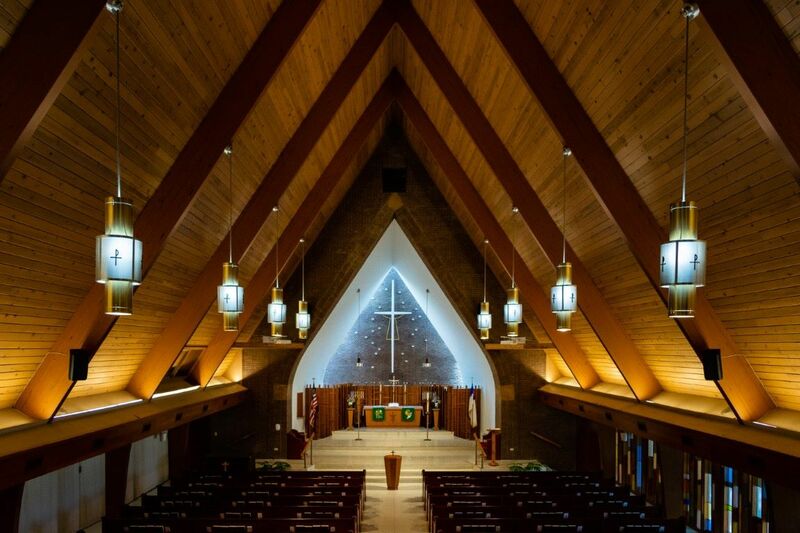 Its style is a significant departure from that of their previous 1901 (I think) wood frame building that previously served them – from drawings I’ve seen, it looks as if it were nearly identical to St. Michael’s Lutheran Church in nearby Winchester. 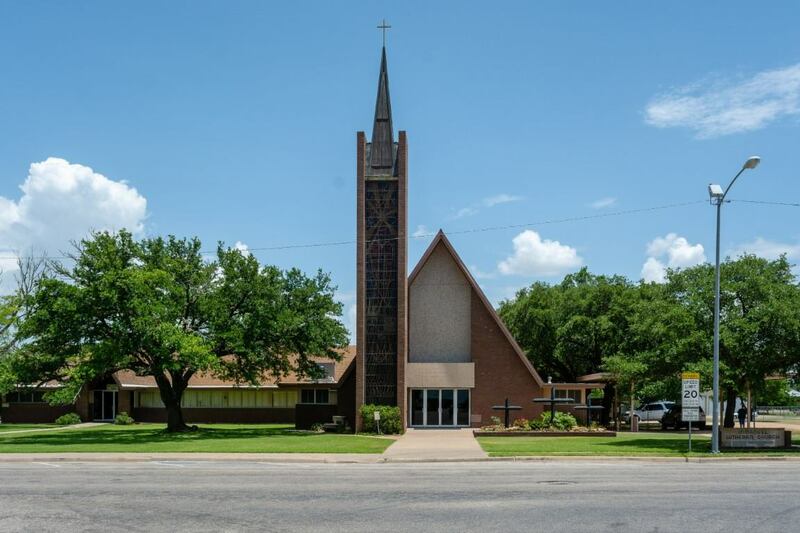 Wukasch was also responsible for St. John’s Lutheran, which is only a few miles north of Giddings, and was completed only a few years before Immanuel. The contrast between this building and the much more conservative (for the time), but still progressive St. John’s building is striking. 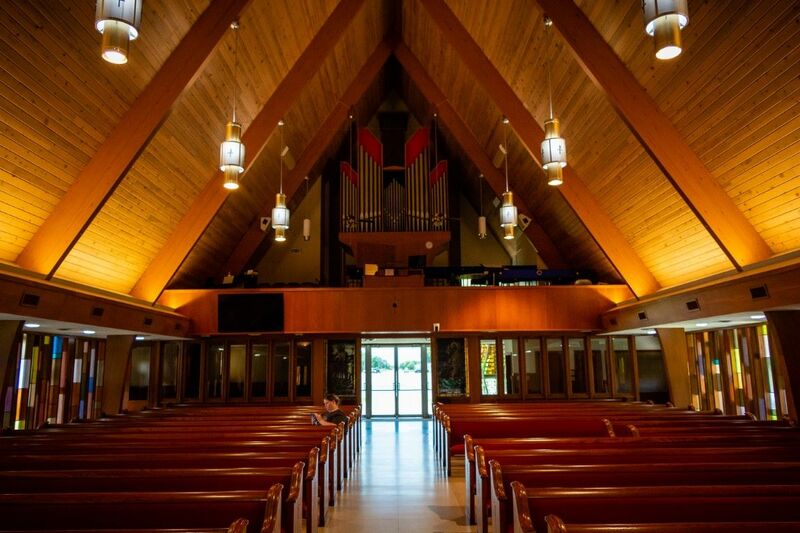 The new building incorporates some elements of the previous church – the two stained glass windows that were located on either side of the altar in the old building are now mounted on either side of the doors from the narthex to the sanctuary. The artwork that graced the center panel of the altar is mounted in a hallway off to the right of the chancel. Several aspects of this building are really interesting. 1. 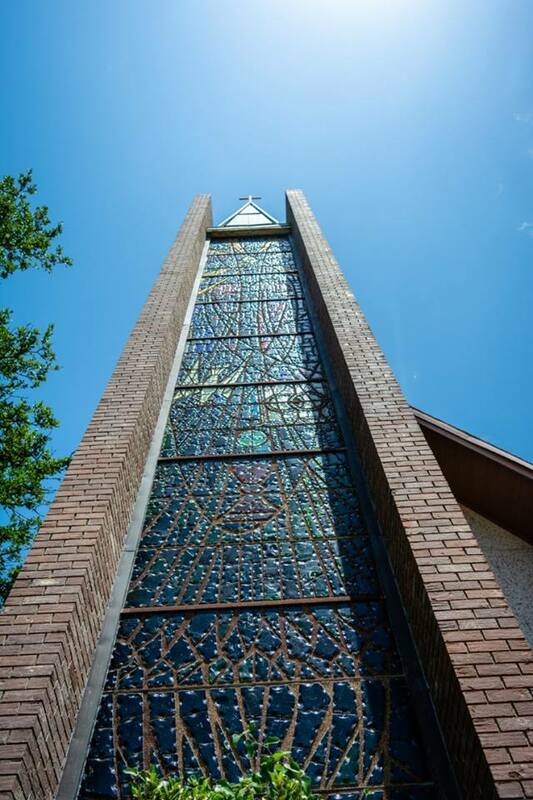 The front of the bell tower is constructed almost entirely of stained glass. I’m told the glass is backlit at night. Unfortunately, the bell tower is somewhat structurally compromised and repair will be costly. 2. There are glass bricks embedded into the wall behind the altar – twelve to the left of the cross, and eleven on the right. These symbolize the disciples – the missing twelfth brick on the right is for Judas, who betrayed Christ prior to the crucifixion. 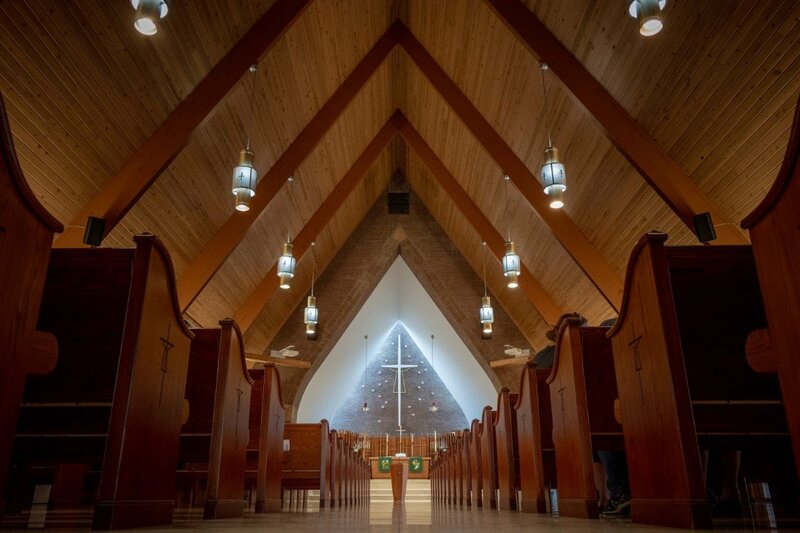 The light from the windows to the left and right of the chancel shines on and refracts through the glass bricks, symbolizing the light of Christ that shines through us. 3. 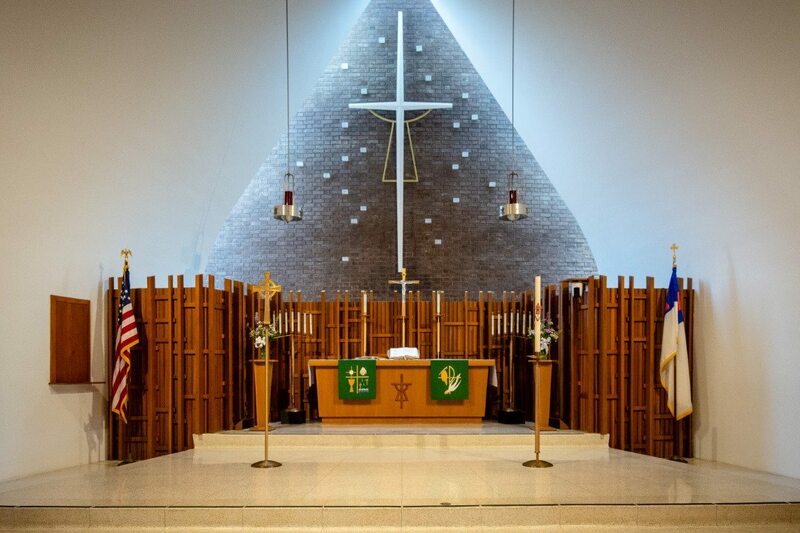 I’m told that Wukasch was big on symmetry, and the chancel features TWO sanctuary lamps. 4. 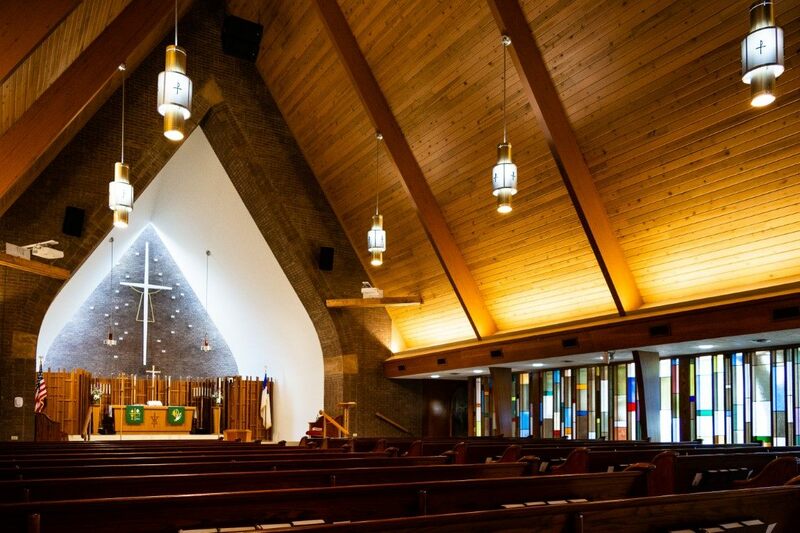 The walls on either side of the sanctuary are constructed almost entirely of colored glass. 5. The area above the front door is decorated with tile. There are a number of small cross/chalice emblems that match the motif on the wall behind the altar (and also on the altar itself and the pews).